Sushma's Page: A Name to Honour - I Am A Gulfi. A Name to Honour - I Am A Gulfi. Dear readers: This referrers to the year 2006 as we bid adieu to India and flew to Qatar finding our bread after the oil here. From the garden city Bangalore to the desert of Qatar. It was that red winged Gulf Airlines that I flew on from the Garden City of India to this Desert called Doha, my home for past 7 years. Only off late I have stopped abusing the airlines that delayed the take off by more than an hour, in turn logged me in mess of missing my transit flight to Doha. A frenzy 24 hours in two other gulf states, courtesy airlines, with my toddler, feeding her whatsoever available in the airports, finally landed in Doha Airport in the middle of winter February night. The real part of new me in new place began in black and white. After a hustle bustle of so called journey, the arrival in Doha International Airport even today sends in that very air in me. I can stand there blinking at the very sight that went blur to my sight that day, with same propensity even now. People weren't running, instead appeared calm, no noise. Huge built Arabs with utmost respect to women like me with child in hand, greeted. Most attires around were either white[men] or full black [women]. Some hardly showed their eyes. My heart fainted with respect shown to ladies, in the airport. Waiver of long queues was big relief. Remember unlike in Bangalore airport not one apart from porter bothered to notice I was managing 12kg handbag with 12kg baby with me. Once out of airport, and into the fancy grey SUV, I smiled to myself. Welcome to Doha reverberated in my ears. As we pulled off, felt an urge to use the seat belt at the rear seat too. Nevertheless, eyes stuck to broad, good roads that seemed like neatly laid car showroom. Only that the cars kept moving. There were hardly any signs of two wheeler, auto rickshaws, or honking over crowded buses or speeding trucks. A short ride took us to grand villa in midst of city. Operating from Qatar officially. Life was getting normal. New routines volunteered. Mornings were beautiful, be it Bangalore or Doha. But sun was shining more here. Did not like it though. There weren't those crows too. Also, I had started missing the morning milk man who rang the shrill bell at 5 am, I had once hated. Few days before settling with a job routine, it was uneasy not to find a cockroach, a fly or a lizard to chase. Neither was that strolling street vendor selling fresh veggies. Hence, the bonus was a brand new car all for myself. I had to proudly show it off to my people in India. Yes. All for myself, remember. Shades of life had changed. From colorful India to black and white. From busy streets to calm ones. It took us few months getting acquainted to their accent and tone. While at times I felt that two Arab men were quarreling, they were actually holding a polite discussion. At times I occasionally found a car coming to screeching halt on a main road, just to politely make way for me to cross. This was bliss. A constant fear on the Bangalore roads if a BMTC bus would almost run over me was overcome by the super respect walker received in this Arab country. I liked this, though not the absence of lizards in the house! Phew. I grew up watching them. No easy signs of an easy availability of "maid", so I played the role of one initially. That meant, every night when I had to do away the trash in the exterior of the compound, there were huge pairs of eyes staring me. Never in my life had some huge built cats stared (shall stab you kind of), after all, for throwing trash. 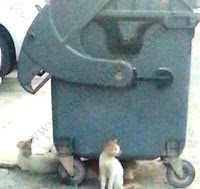 Absence of street dogs out in Arab country, made the cats apparently grow too naughty. I had to assume. Or perhaps I did not have much of non veg stuff for them may be, too. However the cats did not bother me much. Lesser greenery did. I payed heaven and hell to actually purchase even grass and soil. Good heavens. Welcome to desert, I told myself. Closed air conditioned homes and bottled water at times choked me. Forcing me to flee to the peace of the temple environment. But alas. No luck. The monotonous Mosque prayers had started pleasing me. I liked the melody and rhythm with which people prayed punctually 5 times a day. I got used to it to the extent of omitting usage of morning alarm of 4 am. My better half had got used to taking prior telephonic appointments with the barber unlike in India. City provided limited entertainment opportunities. Within an 20km radius we would reach desert with vast stretch of the Arabian Sea, on outskirts of the city. En-route got you external view of the Oil refineries, the only existing water desalination plant. This was one unique outing. Rest of them included few parks and malls. City had started taking roots into us as our home. 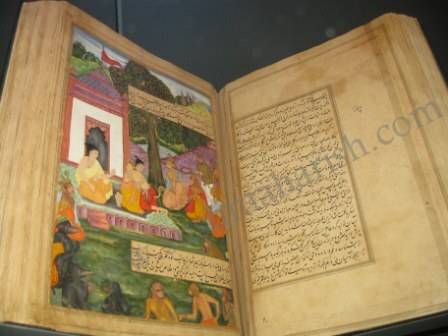 One museum that existed in the city displayed few antiques that were either from Iran, or India. A page of Ramayana excited us a bit. Another worth mentioning issue is the amazingly disciplined Police. They will emerge in front you at the drop of hat, on one call, for any help. Also catch and warn you for being naughty on roads or for breaking rules. I have always fallen in love with the attitude of police here. The coordination and regulation in times of serious traffic jams even in big signals, are worth admiring. The local Arabs turned out to be very polite and sweet people. In winter they built Marquees here and there and partied with music dance and food. Occasionally as we found people from our hometown, we would be thrilled, I would rejoice with child like excitement. Over years, as we visited India for holidays, the NRI status started sinking into us. Ironically, being in Gulf state sends your residential status on a toss to find you as an NRI in India and a "Permanent resident but Not Citizen" of Qatar. Life moved on, as we descended from the colourful garden city into the black and white desert. Now, I could put on a badge myself, a name to honour, pat my back and say "I am an Gulfi". At times my heart leaped to Bangalore, but would return promptly at the very thought of the noisy streets, quarrelsome auto drivers, or the salivating street dogs outside your gate.This isn't all. Yet a glimpse of an overview. I agree with you absolutely.I used to travel to the Middle East very often on business trips. But then,it used to be more to do with bringing back shopping or converting Exchange to INR. I realise ,ME must have changed now and you are enjoying best of India and Doha. You bet Sir. I'd say the life here is much more preferable but for few social compromises which can be compensated. Indian expats account to 60% here. Its a nice post. I'm a guy from Ludhiana. Working in Amritsar these days. Sweet, tall and good looking guy. Earning a good money from Private company deals in educational products. Looking for a girl who asks for lot of love, care and emotional support from a guy. I am certainly of come up with such love for her. In order to get me on phone, just dial 09316235118 or mail me at umesh.bawa19@gmail.com.